1840 1d Black, SG 2, Plate 1B, S-G. A four-margin example, affected by a vertical filing crease, tied to cover to Prestonpans and showing a very fine GARMOUTH/PENNY POST alongside. There is a straight line Fochabars on the reverse. 1840 1d BLACK, SG 2, PLATE 1B, Q-I, tied to envelope to Wareham by a Red Maltese Cross and showing a No. 1 of Thickthorne and a Woodyates cds with date slugs missing. 1841 1d GREY-BLACK, SG 3, PLATE 7, I-H. A fine four-margin example tied to entire to Dorchester by a very fine WAREHAM MALTESE CROSS in BLACK and showing a straight line CORFE-CASTLE in Red on the reverse. 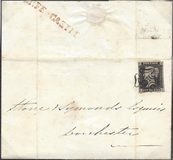 1840 1d BLACK, SG 2, PLATE 8, G-H. A fine four-margin example tied to cover showing "TAUNTON/18AP 1841/PỴ POST" addressed to Wellington tied by a TAUNTON MALTESE CROSS IN BLACK. 1840 1d BLACK, SG 2B, PLATE 6, O-B, RE-ENTRY, SPEC AS41a. A very fine good to large four-margin example tied to cover to London by a fine COVENTRY MALTESE CROSS IN BLACK. 1840 1d Black, SG 2, PLATE 2, O-A. A very fine four-margin example tied to cover to Midhurst by a very fine BIDEFORD MALTESE CROSS in RED. 1840 1d BLACK, SG 2, PLATE 9, N-J. A very fine four-margin example tied to entire from Evenwood Colliery to Durham by a very fine RUSHYFORD Maltese Cross in black and showing on the front a fine WEST AUCKLAND undated circle. 1840 1d GREY-BLACK, SG 3, PLATE 1A, LETTERED O-I. A superb four-margin example tied to small entire to Chancery Lane by a very fine LONDON MALTESE CROSS IN RED. Ex 'Minimus'. 1840 1d BLACK, SG 2, PLATE 1B, D-C. A three-margin copy tied to FRONT to Long Melford, near Sudbury, Suffolk. 1843 SMALL STAMPLESS ENTIRE addressed to Hersham, Northumberland, prepaid '1d' in cash. CANCELLED UNUSUALLY BY A VERY FINE WIGTON MALTESE CROSS IN BLACK. ATTRACTIVE. 1840 1d BLACK, SG 2, PLATE 5, I-F. A very fine four-margin example tied to cover addressed to Portsmouth by a very fine HEYTESBURY MALTESE CROSS IN RED and showing a superb HEYTESBURY UNDATED CIRCLE IN BLUE - SUPERB. 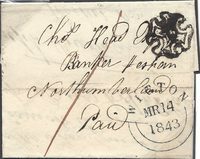 1840 1d BLACK, SG 2, PLATE 2, O-K/P-L BLOCK OF FOUR on entire addressed to London and cancelled by very fine BEDFORD MALTESE CROSS in red. A VERY SCARCE BLOCK OF FOUR, trimmed at right, used ON ENTIRE. CAT £25,000 AS A BLOCK OF FOUR OFF COVER. 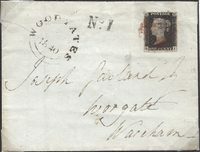 1840 1d BLACK, SG 2, PLATE 4, K-E. A very fine four-margin example tied to 1841 entire addressed to London by a very fine WARRINGTON MALTESE CROSS IN RED and with a fine WINWICK/PENNY POST alongside. 1840 1d Black, SG 2bb, Plate 6, Q-K Re-entry. A superb used four-margin example. 1840 1d Black, SG 2 and 1d Red-Brown, SG 7, lettered P-K - PLATE 11 MATCHED PAIR. An attractive pair from this rare plate. The 1d Black is just cut into at base. Both are cancelled by fine Black Maltese Cross. RPS Certificate. 1840 1d Black, SG 2, Plate 1B, lettered T-L. A superb used example with four good to large margins cancelled by a very fine strike of the Maltese Cross in Red. 1840 1d Black, SG 2, Plate 5, lettered L-A. A superb used example with four good to huge margins cancelled by a very fine Maltese Cross in Red. 1840 1d Black, Plate 9, lettered C-G/D-I. PLATE 9 FORGERY block of Six tied to piece with YORK-type Maltese Cross in Red. 1840 1d Black, SG 2, Plate 5, lettered K-D. A very fine used four-margin example cancelled by a very fine strike of the Maltese Cross in black. 1840 1d Black, SG 2, Plate 2, lettered O-E. Very fine used with good to large margins cancelled by a fine Maltese Cross in Red. 1840 1d Black, SG 2, Plate 4, lettered N-K. A very fine example with four large margins cancelled by a very fine Maltese Cross in Red. 1840 1d Black, SG 2, Plate 7, lettered L-A/L-C. A very fine used four-margin horizontal strip of THREE - Scarce multiple from Plate 7. 1840 1d Black, SG 2wi, Plate 1B, lettered L-C. A fine used four-margin example with WATERMARK INVERTED, Spec AS 5L. Cat £1750. 1840 1d Black, SG 2, Plate 6, lettered I-K. A very fine used four-margin example cancelled by a DISTINCTIVE MANCHESTER 'FISH TAIL' MALTESE CROSS. Cat £1400. 1840 1d Intense Black, SG 1, Plate 5, lettered G-F. A superb good to large four-margin example cancelled by a SUPERB strike of the Maltese Cross in black. 1840 1d Black, SG 2, Plate 1B, lettered Q-K. A superb used good to large four-margin example cancelled by a superb black Maltese Cross. 1840 1d Black, SG 2, PLATE 10, lettered Q-H. A superb four-margin example cancelled by a very fine strike of the MALTESE CROSS IN RED - RARE ON PLATE 10. 1840 2d Pale Blue, SG 6, Plate 2, lettered Q-I. A very fine used four-margin example with 1844 LONDON NUMERAL CANCELLATION. Scarce. 1840 DEC 31st. 1d BLACK, SG 2, PLATE 4, lettered T-K. A SUPERB FOUR-MARGIN EXAMPLE SHOWING PART INSCRIPTION AT BASE, tied to entire to London by a VERY FINE BAGSHOT MALTESE CROSS IN RED. AN ATTRACTIVE MARGINAL INSCRIPTION ITEM. 1840 1d GREY-BLACK, SG 3, PLATE 11, lettered H-K. A three-margin example tied to Entire to Bristol by a fine HEREFORD Maltese Cross in Black. Small faults. RPS CERTIFICATE. Cat £16,000 on cover. 1840 (6th JUNE) 1d BLACK, SG 2, PLATE 2, F-A. A very fine four-margin example tied to Entire to London by a VERY FINE DUBLIN MALTESE CROSS IN RED. 1840 1d Black, SG 2, Plate 2, tied to cover to Southampton by a fine NEWPORT/ISLE OF WIGHT Maltese Cross, stamp cut-into at the lower right-hand corner. 1840 1d Black, SG 2, PLATE 8, N-E. A very fine four-margin example tied to local entire from "Brightlingsea Vicarage" by a very fine COLCHESTER MALTESE CROSS IN RED. 1840 1d BLACK, SG 2, PLATE 4, C-E. A very fine four-margin example tied to Entire to Alston Moor by a very fine BARNARD CASTLE MALTESE CROSS in red and showing a COTHERSTONE/PENNY POST alongside. 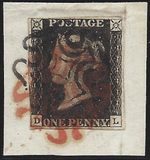 1840 1d INTENSE BLACK, SG 1, PLATE 5, P-F. A very fine four-margin example tied to cover to Glasgow by a fine PLYMOUTH Maltese Cross in Red. 1840 1d Black, SG 2, Plate 6, L-B. A very fine four-margin example tied to entire to Inverary by a SUPERB CAMPBELTON MALTESE CROSS in Black. 1840 1d Black, SG 2, PLATE 4, L-B. A very fine four-margin example tied to cover to Aberdeen by a fine BERVIE Maltese cross in Black. 1840 1d Black, Plate 5, D-L. A very fine four-margin example tied to piece by very fine strikes of the MALTESE CROSS IN BOTH BLACK AND RED, Spec A1vk. 1840 1d BLACK, SG 2, PLATE 2, C-F, tied to Envelope to London by a very fine YARMOUTH-NORFOLK Maltese cross in Red. 1840 2d Blue, SG 5, Plate 1, lettered L-J. A superb used four-margin example cancelled by a very fine atrike of the Maltese Cross in red. 1840 1d BLACK, SG 2, PLATE 5, K-L. A very fine four-margin example tied to cover to Halifax by a very fine DONCASTER MALTESE CROSS in RED. 1839 CHARLES WHITING "POST OFFICE PERMIT" printed by "The Post Circular". A VERY FINE EXAMPLE IN BLUE. See under Essays, GB Spec, Page 5. 1840 1d BLACK, SG 2, PLATE 3, H-H. A four-margin example tied to Cover to Ulverstone by a fine straight line BROUGHTON, a sub-office of PRESTON. On arrival at Preston it was struck with a VERY FINE PRESTON "MAGENTA" Maltese Cross. RARE. 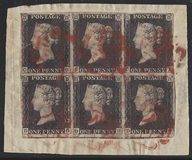 1840 1d Black, SG 2, Plate 2, H-H. A superb four-margin example tied to Entire to Blackburn by a very fine PRESTON MALTESE CROSS IN RED and POULTON/PENNY POST in black, Spec A1ya. Cat £6,000. 1840 1d BLACK, SG 2, PLATE 5, D-J. A very fine four-margin example tied to Entire to London by a fine STOCKTON MALTESE CROSS IN RED; also showing a superb SEATON/PENNY POST. 1840 1d BLACK, SG 2, PLATE 6, A-B. A very fine four-margin examplke tied to cover to Kendal by a fine LEEDS MALTESE CROSS IN RED. 1840 1d Black, SG 2, Plate 4, S-G. A very fine four-margin example tied to Entire to CROYDON by a very fine KINGSTON Maltese Cross in red and showing a very fine WEST MOULSEY/PENNY POST. Attractive. 1840 1d Black, SG 2, Plate 3, lettered G-L, with small to just touched margins, tied to envelope to Lancaster by a fine CHESTER MALTESE CROSS in Red. 1840 1d Black, SG 2, Plate 2, Q-A. A fine four-margin example tied to Entire to Ludlow by a HEREFORD Maltese Cross in Black. 1840 1d BLACK, SG 2, PLATE 5, O-L. A very fine four-margin example tied to Entire to WYMONDHAM by a very fine LONDON MALTESE CROSS IN RED. 1840 1d Black, SG 2, Plate 7, D-B. A fine three-margin copy tied to cover to OLNEY by a fine BEDFORD MALTESE CROSS IN RED.